Hello and welcome to exampundit. 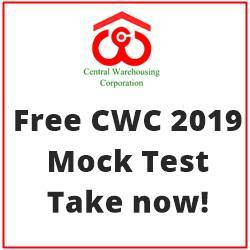 Today we are sharing a Full General Awareness Mock Test for SBI PO and Clerk Mains 2018. 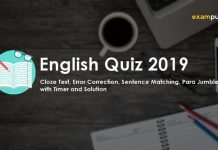 This mock test contains 40 Questions with a 35 minute timer. Federal Bank has received the Reserve Bank of India’s regulatory nod to open offices in of the following country(s)? Which of the following cricketer(s) has/have been recently inducted into the ICC Cricket Hall of Fame? Asian Development Bank (ADB) has agreed in-principle to provide how much amount of loan to Punjab for various urban development projects? 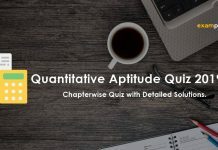 Which one of the following is a type of banking application which authorises a bank to block a specific sum of money in an individual’s bank account to be invested in an Initial Public Offer (IPO)? Section 31 of the Negotiable Instruments act,1881. What is the currency of of Rwanda? Bank of Baroda recently sign MoU with 10 companies including Uber, Oyo, Lava and Flipkart to provide loans to members in their supply chain worth ____. Bank of Baroda recently sign MoU with 10 companies including Uber, Oyo, Lava and Flipkart to provide loans to members in their supply chain worth ₹500 crore. What is the dimension of the new ₹100 notes? Which of the following sections of Banking Regulation Ac 1949 directs Restriction on loans and advances? Who among the following was appointed Secretary, Central Vigilance Commission (CVC)? Government shortlisted how many young players for a scholarship programme under the KHELO INDIA Talent Identification Development Scheme? Lakshya Sen is related to which sports? How much amount did NABARD sanction under Rural Infrastructure Development Fund (RIDF) to West Bengal during the first quarter of 2018-19? Which of the following state launched ‘Commercial Tax at your door steps’ on the occasion of Goods and Services Tax (GST) Day? International Youth Day is observed on ________. With which organisation(s) did Big Basket tie up to help small farmers in India? Omkareshwar Temple is located in which state? Wanakbori Thermal Power Station is located in which state? Changtang Wildlife Sanctuary is situated in which state? Which state government has decided to set up a cultural centre worth about Rs 184 crore? Which of the following section in Reserve Bank of India Act 1934 empowers RBI with the Right to issue bank notes? What was India’s rank in terms of money parked by its citizens and companies with Swiss banks? India’s first Global Mobility Summit, NITI Aayog’s ‘MOVE: Global Mobility Summit’ will be held in ___________. Which of the following company has launched of Mutual Funds transactional capabilities on Facebook Messenger through their virtual assistant Arya? What is the maximum deposit limit per annum under Sukanya Samriddhi Account? Moin–ul–Haq Stadium is located in which state? Baglihar Dam is located in which state? Deposit Insurance and Credit Guarantee Corporation or DICGC insures all bank deposits except: (i) Deposits of foreign Governments; (ii) Deposits of Central/State Governments; (iii) Inter-bank deposits; (iv) Deposits of the State Land Development Banks with the State co-operative banks; (v) Any amount due on account of and deposit received outside India; (vi) Any amount which has been specifically exempted by the corporation with the previous approval of the RBI. Which of the following constitute the code of conduct for merchant bankers as stipulated by SEBI? Which one of the following is introduced by banks to increase financial inclusion? In case of National Electronic Funds Transfer or NEFT, Clearing Centre shall maintain record of all payment instructions processed by it for a period of __________. Which of the following is an example of Veblen Goods? Definition of Veblen Goods – A good for which demand increases as the price increases, because of its exclusive nature and appeal as a status symbol. For eg. Bajaj Pulsar is not a luxury/exclusive bike, but Harley Davidson bikes are an example of exclusive bikes. Diamond Jewellery is also an example of Veblen Goods. Banker- customer relationship is often considered as a fiduciary one. What is this relation based on? The interest rate at which the RBI lends to Commercial Banks in the short term to maintain liquidity its known as ___? India recently became the ______ shareholder of the European Bank for Reconstruction and Development (EBRD). European Bank for Reconstruction and Development (EBRD) HQ is in London, UK. 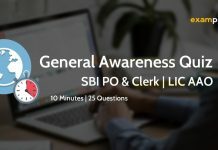 Please let us know in the comment section about your views on this Full General Awareness Mock Test for SBI PO and Clerk Mains 2018.